Book Proposal Secrets - How to Write a Book Proposal! All Without EVER Having to Write a SINGLE WORD! Based on the book proposal, publishers will often ACCEPT the book idea -- offering you a PUBLISHING CONTRACT and a sizeable ROYALTY ADVANCE. Then you go ahead and finish writing the book. So, read on – and let me show you the SECRETS of writing a winning book proposal. If you hope to get a book commissioned in today's more-competitive-than-ever publishing environment, Book Proposal Secrets is essential reading! Gain An IMMEDIATE Advantage Over 95% of Authors! And Enjoy Having MONTHS to Write Your Book! Book proposals are a FANTASTIC idea! You spend just a couple of hours preparing your book proposal. Then you mail out your package to a number of leading publishers, and wait for the offers. No more months of writing. No more returned manuscripts. Without a doubt, book proposals are the BEST WAY to get a publisher. However MOST authors don’t understand how to create a book proposal. Do you know EXACTLY what you should – and more importantly, should NOT – include when submitting your book proposal? Should you include a sample chapter or NOT? And if you do, how many chapters should you send? And do you know the difference between a full proposal, and a mini-proposal? What about the single most important part of your book proposal – something that MOST authors only spend a couple of minutes working on? Fix THIS and you’re almost guaranteed success. There are a whole series of rules that busy editors EXPECT you to follow. Get these wrong – and you might as well be sending in your full manuscript, with the other 95%. Your work will simply be rejected. But get it right – and you can practically GUARANTEE yourself a publishing contract. Book proposals are EASY. Want to learn more? You'll never get your book published unless you first discover book proposals. Book Proposal Secrets is the quickest and easiest way to beat the system. I've Worked With the BIGGEST Publishers Around! I Know What REALLY Works, And I Want to Show You! My name is Dan Strauss – and I’d like to thank you for reading this far. Over the past nine years, I’ve worked as publishing commissioner for the Self Development Network. And over the past 25 years, I’ve worked with some of the biggest publishers around - such as Springer, Harper Collins, Apress, and Inspire3 Publishing. I’ve personally handled over 700 book proposals – and helped write over 120 winning book proposals. And I know how to write a KILLER BOOK PROPOSAL. That’s why my own publisher, the Self Development Network Network, begged me to put my knowledge together into a brand new course. So, I wrote my own book proposal, which was immediately accepted... Enjoyed a fantastic five-figure cash advance... And spent the next three months writing my greatest piece of work EVER. Inside this new course, you’ll discover EXACTLY how to write your own killer book proposal for MAXIMUM SUCCESS. I’ll show you PRECISELY what a publisher is looking for – and how to deliver it in a way that makes them get out their pen and write you a royalty advance check/cheque IMMEDIATELY! In my course, you’ll discover the SECRETS that most authors NEVER REALIZE. You’ll save yourself both time and money – AND you’ll bag yourself a top-notch publisher without having to finish your manuscript first! Take a Sneak Peek INSIDE Book Proposal Secrets! - By Tapping Into These Little-Known Insider Tactics! So, would YOU like to take a sneak peek inside “Book Proposal Secrets”? Inside my 90-page course, you’ll discover EVERYTHING you need to sell your book idea to a publisher, and enjoy a fantastic advance. ... All BEFORE you get round to writing chapter two! Discover how today’s busy publishing machine REALLY works – and why book proposals allow you to BEAT the system! Uncover the REAL advantages to book proposals, and how they can save you more than just time and money! Find out EXACTLY what editors are looking for in a book proposal. Then follow my instructions to write it! Check out the TEN SECRET STEPS to writing a KILLER book proposal! The FOUR WAYS you can use a book proposal to help refine your book idea – without having to write the manuscript first! The MOST IMPORTANT PART of any book proposal – and the FIVE SECRETS for getting this part exactly right! The THREE HOOK system, and why you need this to sell your guide in RECORD TIME! Read a FULL, SUCCESSFUL book proposal. Just copy, paste and edit – for guaranteed success! PRECISELY what kind of biographical information you should be including in your book proposal, and the secrets for organizing it correctly! How to analyze and obliterate competing books in your proposal - in just SEVEN EASY STEPS! Why you MUST prove the need for your book – and the simple two-step system that does it for you! How to get FIVE-STAR REVIEWS and recommendations for your book – even before it’s written! GREAT for convincing a publisher! The SECRET FOUR-POINT TECHNIQUE for writing the perfect book outline that ANY publisher will snap up – in just MINUTES! What to do if you’ve already WRITTEN a book and want to turn it into a book proposal to maximize your chances of success! Uncover FULL GUIDANCE on everything you should include in your proposal from the contents page to the back matter, and other things you probably never even thought about! Discover EXACTLY what a MINI-PROPOSAL” is and the nine-point plan for writing one, TODAY! FIVE STEPS to deciding whether you’d be better off submitting your proposal to a publisher, or an AGENT! How to choose the BEST PUBLISHERS to send your book proposal to and what happens next! And all of this advice applies the WORLD OVER, including the USA and UK -- with valuable country-specific insights where required. So, would YOU like to sell your book idea – and get published within a few months? Well, you can, with Book Proposal Secrets. And Enjoy These THREE BONUS Guides, for FREE! Including Our TEMPLATES for ANY Book Proposal! Remember, book proposals typically attract four- and five-figure advances. Yet six- and seven-figure cash payments are becoming increasingly more common in the publishing world. As a special bonus for individuals that decide to own Book Proposal Secrets during April, I’m also including a further THREE BONUS GUIDES – to help GUARANTEE your publishing success! If you don’t convey PASSION in your book proposal, you won’t get published! This 15-page guide shows you EVERYTHING you need to know to charge your proposal with 110% ENERGY. You’ll learn the Four P’s system for adding punch to your writing, and discover our simple Search/Replace List for bringing your words to life. This is CRITICAL – and could mean the difference between a rejection slip, and a publishing contract! So, you’ve written your book proposal. Now, where do you send it? Don’t worry. Just consult my own PRIVATE black book of contacts – and you’ll find the EXACT publishers you’re looking for. My black book contains links to thousands of publishers throughout the globe – from the USA, UK, Australia, Germany, France, and more. You’ll find EVERYONE in here – all fully-updated for 2019. Can’t be bothered putting together your own book proposal? No problem! Just swipe ours and insert something into the blanks! This 20-page bonus guide contains full, PROVEN successful book proposal templates. Covering templates for general books, fiction, non-fiction, gift books, how-to books, crime books, self-help books, marketing books, even e-mail and fax templates. Just copy, paste, and edit – for instant success! Get Ready to BEAT The Crowd - And Get PUBLISHED! ... Just By Investing a FEW DOLLARS - TODAY! So, are YOU ready to write your book proposal? With this single course, you’ll beat the 95% of authors out there that have NO IDEA how to submit their books to publishers. You’ll save yourself months, if not years, of pointless writing. You’ll secure yourself a publishing contract with the BEST publisher. You’ll enjoy a sizeable cash advance. And you’ll be wondering why you NEVER did this before! So, how much does the entire Book Proposal Secrets course cost? As part of our special April promotion, we’re cutting down the cost of the full Book Proposal Secrets course to JUST $47. That buys you the ENTIRE COURSE, plus ALL THREE FULL BONUSES. AND, you'll also receive FREE LIFETIME SUPPORT from our team, just in case you have ANY questions. This is the best price we’ve EVER offered our course – and there’s NEVER been a better time to get started and write your book proposal. So, FEEL POSITIVE – and excited! – and click on the following button to own YOUR copy, TODAY! Here's My 100% No-Quibbles Refund GUARANTEE! Within Just 3 MONTHS - Or You Get Every Penny Back! I want to make your decision to purchase the Book Proposal Secrets course absolutely RISK-FREE! I personally guarantee that you’ll love the course. And I also guarantee that if you follow my instructions, you WILL secure a publishing contract AND a sizeable advance within just THREE MONTHS – or I’ll refund every single penny you paid. Don’t worry: There are NO questions asked, and I won’t require any form of proof. All I ask is that you try out the course for three months. If you don’t secure a FANTASTIC publishing contract, or you aren’t absolutely thrilled for any other reason, just send it back before six months is up – and I’ll give you a full refund (minus our original S&H). That’s a guarantee backed up by my publisher, the Self Development Network too – so you know that your money is safe. That’s my total, RISK-FREE, 100% “Thrilled Customer” GUARANTEE! So, click on the button to grab YOUR copy of the full course, with bonus guides and FREE lifetime support! Book proposals are the secret tool of professional authors. 95% of authors don’t know about them – and that’s why they remain unpublished. You're now one of the lucky 5%. So take this opportunity to learn the REAL SECRETS of writing a killer book proposal. Find out EXACTLY what editors are looking for – and how to use your proposal to grab a fantastic publishing contract and super-sized advance! All without having to write a single word of your book! So, click on the big brown button – and get ready to enjoy total writing success! PS. 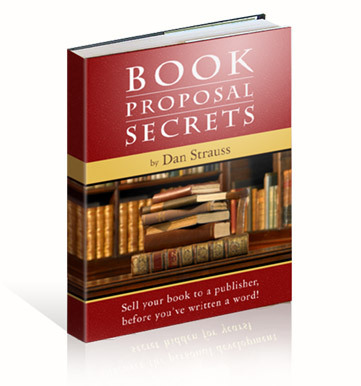 The Book Proposal Secrets course is EXCLUSIVELY available on this site! You won’t find it in stores, on eBay, or anywhere else online. If you want to take advantage, you MUST purchase from this site. So try it out. Click HERE to enjoy publishing success! PPS. Don’t go back to being one of the 95%! Now that you’ve discovered WHY you’re getting rejected, make the decision to CHANGE. Discover the secret behind book proposals, and grab YOUR copy of the course. Click HERE to purchase for JUST $47! PPPS. Remember, EVEN if you’ve already written a book – you can STILL create a book proposal from it! It’s easy to do. (Actually it’s easier to do!) Just follow the instructions inside my guide. Click HERE to get started!